Click here for a photo image of the TEXAS! The USS TEXAS was the United States' first battleship, being commissioned a month earlier than USS MAINE. USS TEXAS took part in the bombardment of the fortress on Cayo del Tore, Guantanamo Bay, Cuba in concert with USS MARBLEHEAD. She also took a very active part in the Battle of Santiago. The USS TEXAS was authorized by the U.S. Congress on August 3, 1886. She was built from English plans developed as a result of a design competition The prize for the winning design was $15,000. The ship was built at the U. S. Navy yards at Norfolk, Virginia. USS TEXAS was commissioned on August 15, 1895 and became the first bonified United States Battleship. From her commissioning, she cruised off of the East Coast of the United States, and also in the Gulf of Mexico. Together with USS MAINE, she participated in the 1897 Mardi Gras celebration at New Orleans. At the outbreak of the Spanish American War, she was assigned to the "Flying Squadron" and arrived off Cuba on February 21, 1898. She began regular patrolling and blockading duty. On June 16, 1898, USS TEXAS and USS MARBLEHEAD bombarded the fort at Cayo del Tore in Guantanamo Bay, damaging the fort to the point that it was no longer a threat to the United States forces. On July 3, she took an active part in the Battle of Santiago. At the opening of the battle, the ship found herself in a very precarious position, as USS BROOKLYN, maneuvering for position, was on a possible collision course with her. How close the two vessels actually came to colliding has been a subject of debate ever since. USS TEXAS attacked four of Admiral Cervera's vessels at one time during the battle: VIZCAYA,CRISTOBAL COLON, PLUTON and FUROR. She also is credited with action against INFANTA MARIA TERESA, and OQUENDO. Even before the signing of the peace treaty between the United States and Spain, the TEXAS was returned to American waters, arriving in New York on July 31, and staying in the vicinity of the city until November. Afterwards she again began patrolling generally off of the U.S.'s northeast coast except for periodic visits to Cuba, Puerto Rico, etc. USS TEXAS was briefly decommissioned in 1901 for repairs, but recommissioned on November 3, 1902. She served as the flagship of the "Coast Squadron" until 1905, and continued to serve with the squadron until 1908. In 1908 she became a station ship at Charleston, South Carolina. On February 15, 1911, the USS TEXAS was renamed USS SAN MARCOS so that the old name could be given to a new battleship (BB-35). She was struck from the Navy rolls on October 10, 1911. The United States' first battleship was sunk as a target in Tangier Sound in the Chesapeake Bay. 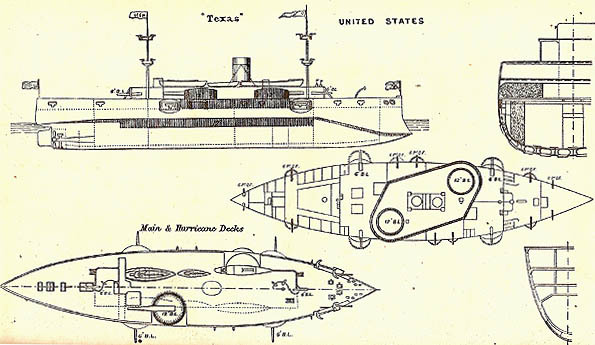 USS TEXAS was built from plans developed in England, and did represent a great step forward in American naval defenses. However, when compared to her contemporary, the USS MAINE, she carried less heavy armament, and had a smaller coal bunker capacity. In practice USS TEXAS was apparently slightly faster than the MAINE. The TEXAS had overhanging sponsons which always placed the colliers, depended on by the Navy to supply coal, in danger of being stove in. Also, on loading of coal and supplies, the ship sank so low in the water that the ship's armor belt was submerged below the water and therefore greatly reduced in effectiveness. U.S. Navy Yard, Norfolk, Virginia. 30 officers and 359 enlisted men. Commanded by Capt. J. W. Philip. Philip was promoted to Commodore on August 10, 1898. Clerk of Joint Comittee on Printing, "The Abridgement of Message from the President of the United States to the Two Houses of Congress", Washington: Government Printing Office, 1899. 4 vols. (all are documents relating to the war). Harris, Lt. Cmdr. Brayton, "The Age of the Battleship", New York: Franklin Watts, Inc., 1965. Naval History Department, Navy Department, "Dictionary of American Naval Fighting Ships", Washington DC: Government Printing Office, 1959.